1) Print out the clues on colorful sheets of paper. 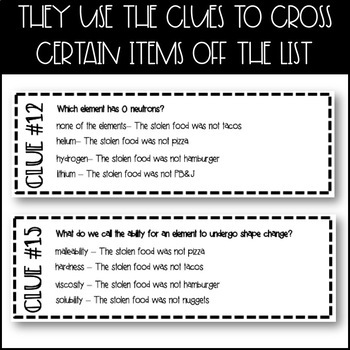 Cut the clues out and place them around your classroom. 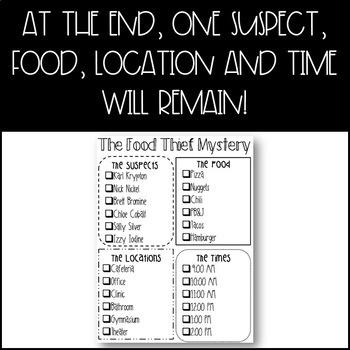 2) Provide each student with a ‘The Food Thief Mystery’ answer sheet. Prior to beginning the activity, I ask the students to make a hypothesis. They place a star next to the suspect, the food, the location and the time that they think is correct. I feel that my students are a little more invested when they have made a guess at the beginning. 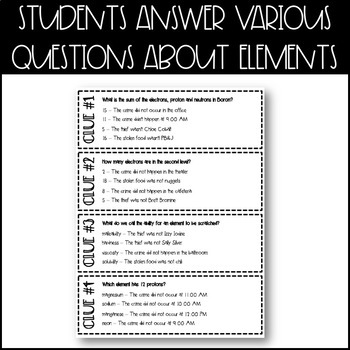 3) This is up to you, but I allow my students to walk around the room with their own copy of the periodic table of elements. You could also project one for the whole class to see. 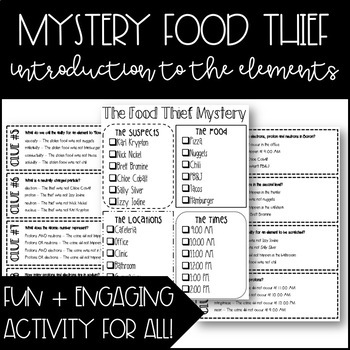 This mystery activity is a fun + engaging way for students to practice the elements. Product Licensing: This purchase permits individual use in one classroom. If you wish to share, please purchase an additional license. Thank you very much for stopping by my store. If you would like to stay informed on my newest products and sales, please click on the green ☆ next to my name. Any feedback on my items is always appreciated, thank you!